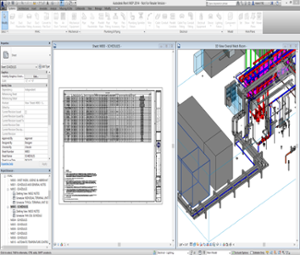 nVent Thermal Management is the first heat tracing manufacturer to provide BIM solutions to help engineers design and model heat tracing projects. We provide a comprehensive suite of tools including BIM families and the dynamic RAYCHEM Trace-It add-in tool for the Autodesk Revit platform. Architects, engineers, contractors and building owners can easily incorporate heat tracing content into their building models to optimize efficiencies and performance. The new Raychem Trace-It 2.0 add-in enables designers working in Autodesk Revit to design, calculate and specify reliable, high quality heat-tracing solutions directly and quickly within their BIM models. Provides a bill of materials for the heat-tracing application, circuiting information and loads to assist with estimating and construction. nVent RAYCHEM provides a suite of BIM families to help designers incorporate heat tracing systems into their BIM designs. Fill out the form and tell us about your BIM designs. ©2018 nVent. All nVent marks and logos are owned or licensed by nVent or its affiliates. All other trademarks are the property of their respective owners. nVent reserves the right to change specifications without notice.